As the semester comes to an end, so do two co-ops in Snell Library. I have been working as the marketing and events planner, and Brittany Tassone has been working in the Digital Media Commons Studio. We have taken some time to think back on our experience here and offer advice to the new co-ops that will take our place in January. 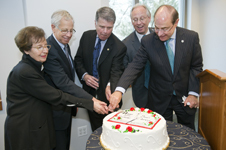 Thank you to Snell Library and our co-workers for two great co-op experiences. – Jen Jen: As the marketing and events co-op I planned Meet the Author events, assisted library staff with many other projects and events, and used Snell’s social media pages to promote library happenings and communicate with the Northeastern community. I gained a lot of marketing experience from this co-op. The Northeastern community is very diverse, and it was valuable for me to have to promote events and campaigns to such an audience. 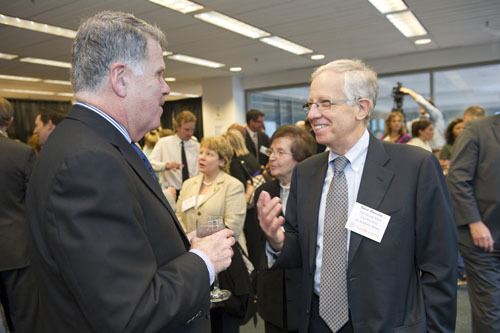 As a Northeastern student, I benefitted from working with different academic departments and student groups, and I feel much more connected to my university as a result. I was not sure what to expect at an on-campus co-op, but it turned out to have been an incredible advantage. I was able to have more freedom and work on a wide range of projects at Snell, and was never stuck with boring or repetitive tasks. My favorite things about this job are that that I did something different every day, gained such a wide spectrum of experience, and got to work with a great group of people. My advice to the next Marketing and Events co-op is to get the most that you can out of working in this position. If you have a good deal of experience when you start, then take on a bit more and come up with new ideas for events and promotions. Also, stay organized and be confident! Brittany: My co-op experience at the DMCS definitely was a good fit for me professionally. I was able to use my creative skills and design some unique promotional material, motion, and website graphics, but I was also able to assist in other student’s project, providing them with help that was crucial for it to be the best itcould be. I did experience some trials during my work, and learned that in the business of customer service you definitely need a lot of patience, and willingness to help. Those are qualities that I feel I possess, making my position here definitely a benefit for the DMCS. Having people that don’t necessarily speak English, or don’t have a large knowledge base about design software could be frustrating at times, but working with different types ofpeople is a lesson that I feel everyone should learn. It was beneficial for me because I know in the future I will definitely have to work with all types of different people to create designs for the intended audience. The best part about working at the DMCS would have to be the great atmosphere my superiors and co-workers created for me. I was able to work on my designs without a huge rush on time, making the transition into my first co-op comfortable for me. My advice to future co-ops would to be to practice using the design software like Adobe Suite, Final Cut, and the iLife suite, as much as possible. It will be very helpful when answering questions in the future. Today I am saying goodbye to a friend and colleague, Maria Carpenter. Maria is leaving Northeastern to become Director of Somerville Public Library. Today is her last day at Snell. 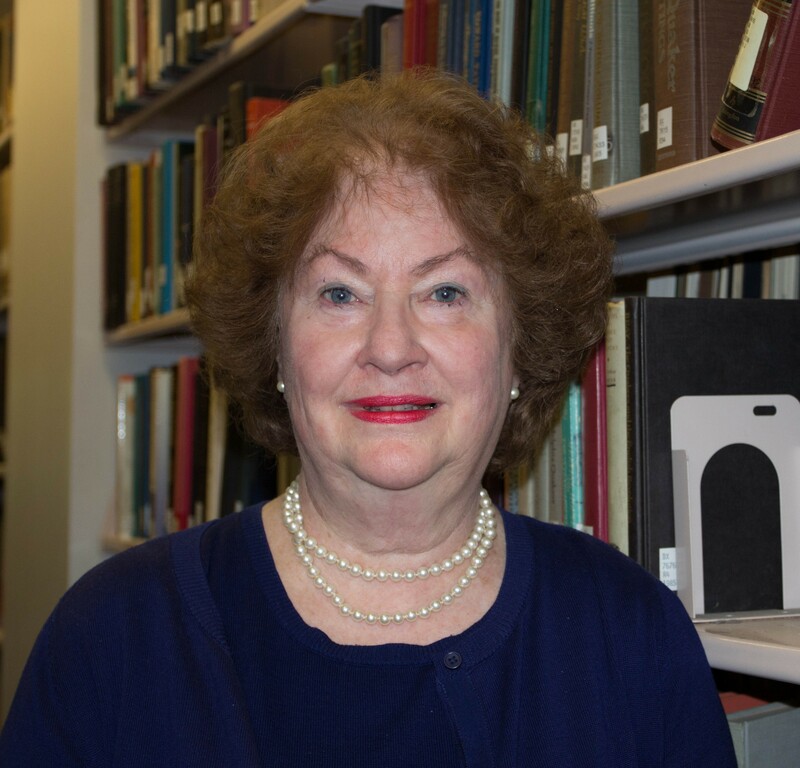 Maria arrived here 10 years ago as a reference and instruction librarian. As soon as we met her we knew she was the one we wanted to hire for the position. It was clear that her first priority as a librarian was attentive, compassionate communication between librarians and library users. 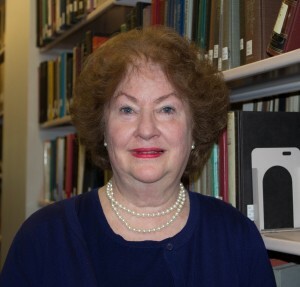 Her role has expanded over the years and as our Director of Advancement, Marketing and Communications (a position she created), she has become the ear and the voice of the library, coordinating all communications, from the suggestion box to press releases to Meet the Author programs. As the Library Web Manager, I have always looked to Maria for support and guidance. She’s been able to give me advice on big picture communication priorities, and she’s been able to read over a sentence and tell me if the tone is right. She’s happy to experiment with any technology that might help the library communicate, including Facebook, YouTube, Flickr and Twitter, and she was the force behind the creation of this blog. Above all, Maria has always been a great bridge for me. I think that’s because she makes a point of going outside the library. She attends NU events and professional conferences, audits classes and has dinners with alumni. 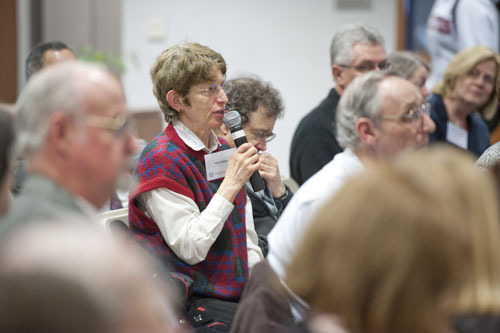 Everywhere she goes, she listens to what people say about Snell Library and brings their perspectives back to me and my colleagues, asking us to look up from our books and our laptops and engage with what’s going on at Northeastern and beyond. Not content with the relentless pace of her professional library activities, Maria’s recently begun to take an interest in yoga, and has found it so satisfying that she’s become an instructor. One of the things I will miss is being able to attend the occasional noon yoga class she leads for her friends in the seminar room at Snell, once again, getting us to lift our heads up from our laptops and stretch a little. In fact, stretching is what I expect Maria to continue to do, in who-knows-what unexpected directions, when she takes the reins at Somerville Public Library. Back here at Snell, I shall follow her career with interest, and I hope that once in a while she’ll meet me for a Mark N Stormy at Highland Kitchen, so we can continue talking about the future of books, libraries and communities as we’ve been doing for the past ten years. Goodbye, Maria, and always when you stretch, don’t forget to breathe! To view the official press release of Maria’s departure, visit the Northeastern University Libraries’ News & Events page. 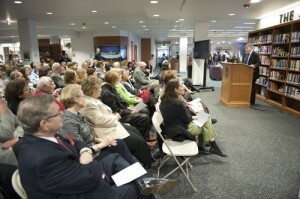 A large crowd showed up for Archivist of the United States David S. Ferriero's talk in Snell's lobby. The audience was able to ask questions. 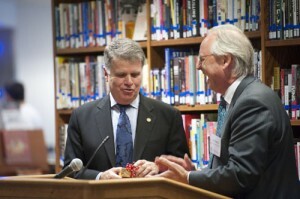 As our featured speaker of the afternoon, David Ferriero was presented with a gift by Dean of Libraries Will Wakeling. 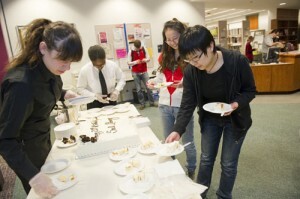 After the talk, there was delicious cake available for students who needed a break from studying for their finals. 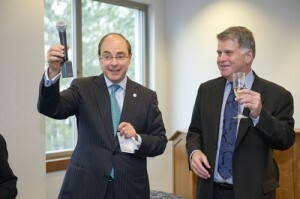 The VIP guests at the event were invited upstairs to a reception. 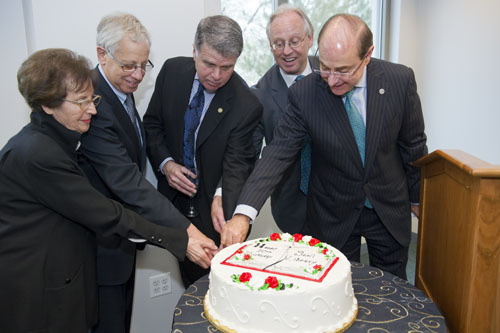 ...and also cut the celebratory cake with Nancy Caruso (David Ferriero's co-op advisor), Provost Stephen Director, David Ferriero, and Dean Will Wakeling. 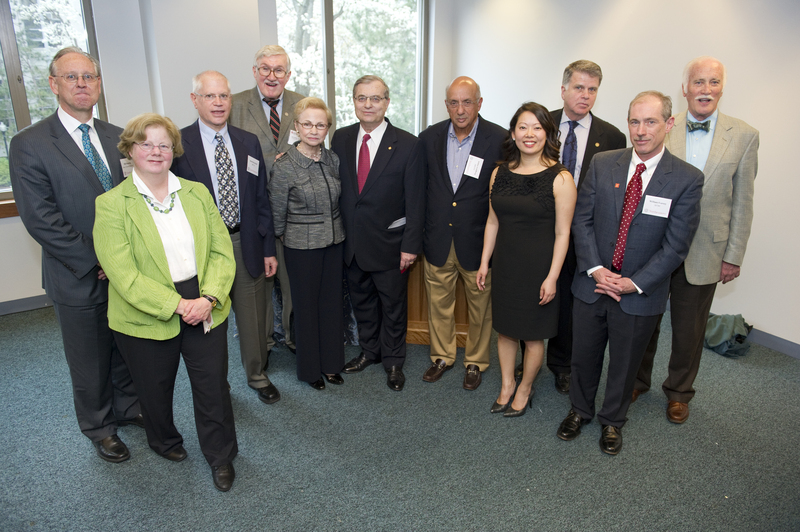 A group of Snell Library's major donors in attendance at the event. 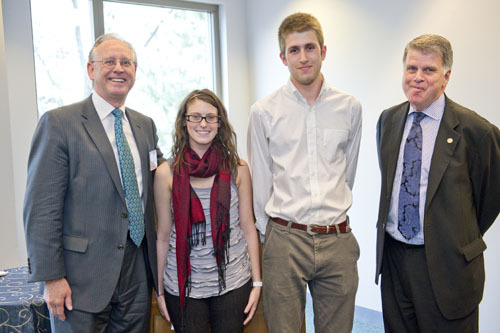 Past co-op students Jordan Hellman and Steven Olimpio gave speeches on their experiences working at Snell.